Amazon has contrived something new to spur envy among authors. They're calling it "Amazon Author Rank, the definitive list of best-selling authors on Amazon.com." Bezos and crew apparently believe there aren't enough opportunities in the world for one person to begrudge another's success. But I shouldn't complain. Amazon has informed me that I am 9,151 amongst authors of Biographies and Memoirs. Apparently there are almost 10,000 more crips out there more interesting than me. Or, as another author friend pointed out, I shouldn't limit it to crips. I agreed, thinking maybe it's just that there are almost 10,000 more people self-absorbed enough to write about themselves more interesting than me. But of course, it's all unfair, even at that. First, why should we who take ourselves as subjects (writers of memoir) be lumped in with those authors who have everyone who ever lived to use as material (biographers). Couldn't Bezos and boys at least grouped me in with autobiographers? It turns out, computer algorithms being energetic little reportorial demons, that I can even compare myself in other dimensions. 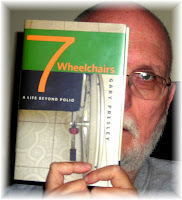 You'll be happy to know The Author Seven Wheelchairs ranks #40,495 in Health, Fitness & Dieting. Does Amazon know that I've lost 35 pounds in the last six months? Would that help my rankings? I eat yogurt and protein bars and drink lots of juice. That ought to be good for a boost somewhere. Bezos and company, however, dislike my pretensions of literary accomplishment. Check me out in Literature and Fiction, and I drop to #101,445. I get it. I'm no Franzen. But I don't envy Franzen anyway. That's a negative, but I don't want to get into how many people, writers or not, that I do envy. There's more than one when we range amongst those folks who don't read, let alone write. We could, if I were interested, start with those who win multi-millions in the lottery. I think that's a practical envy. I could be rich from the lottery without doing anything other than being a beneficiary of good luck. There'd be no need to write something of Franzen-caliber, or even Richard Selzer-caliber, who is a far better subject of envy than Franzen. The lottery: wealth without work or accomplishment. What can be more enviable than that? Good health, I suppose. A happy marriage, sure. Accomplished, appreciative off-spring, of course. But with lottery-wealth I could be more me without doing anything, even writing a book. I bet even Franzen wants to win the lottery. Think of the angst. The ethical quandaries. What material! I am wily enough to know that envy can be good, even though the dude who thought up the Seven Deadly Sins found a slot for it on his list. It can be a spur to better oneself, if nothing else. But envy of author rankings is one more brick in the wall of neuroses I must climb each day to get out of my head. I don't need it. Do you realize Bezos and boys are so ... so manipulative as to update the rankings hourly? Do I need another website to check every hour? * No. I get up, make sure there's nothing urgent in the email. Then I read The New York Times, Slate, Buzzfeed, Facebook, Daily Beast, Reuters, BBC America, and it's 9am, and time to do something useful. I don't need to be ranked, thank you. I am quite satisfied to be among the ten thousand most interesting crips you know. *In the time it took to write this silly little blog post, my Author Ranking fell from 9,151 to 34,072. Explain that, Bezos!